Our Electric Trikes are made by taking Gomier Tricycles and then adding our electric conversion kit. We use the mini-motor with Panasonic tube battery and the final product doesn’t even look electric. This combination really provides a very nice light weight robust tricycle. 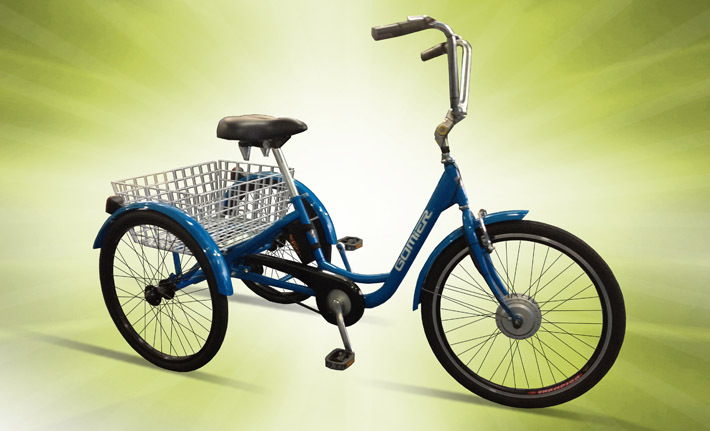 The tricycles are available with either 20 inch wheels, 24 inch wheels or 26″ wheels. They come as either single speed, 3 speed with the internal SHIMANO Nexus hub, and 6 gears with a derailleur. There is even a single speed 24″ industrial model for very heavy people or if carrying great weights. Tricycles are available in red, black and blue. The industrial models come in yellow. The little mini-motor is located in the front hub and the battery is well located in the basket. It very much resembles a regular trike and people won’t even notice it’s electric. It really is a step above production line electric trikes in regard to style, weight and performance due to using the highly reputable Gomier brand and our conversion kits. It will reach a top speed of around 20-25km/h and has a range of about 20-30km with light pedalling. Price is $1950 with 9Ah battery. Larger batteries are possible for greater range, at increased cost.